Search "Doulton HIP" 5 results have been found. 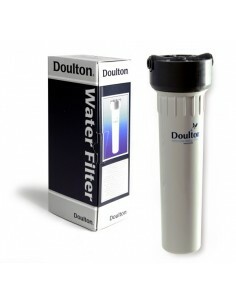 The Doulton HIP waterfilter made from food grade plastic, is a cost-effective and easy to use filter unit. It can be used to provide filtered drinking water via a separate faucet. 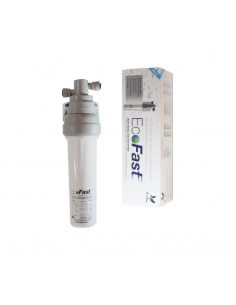 The Doulton EcoFast filter housing has a smart design with integrated mounting bracket and 3/8"push-fit connectors. Changing your ceramic filter is made easy: a quarter turn of the housing body automatically shuts off the water supply. 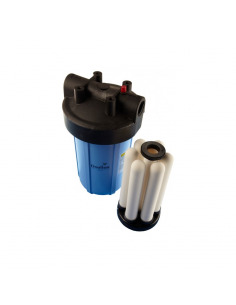 You can then change your Doulton® water filter element without any tools required. 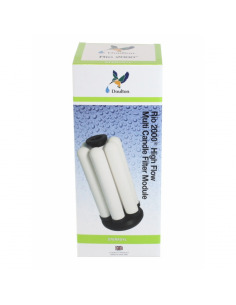 The Doulton RIO 2000 water filter system treats the water supply for your entire house. The RIO 2000 is fit with six ceramic sterasyl filter elements that filter out bacteria, cysts and other pathogens from your drinking water. Also, sand and rust particles that have fallen into your drinking water are removed. Doulton filter module complete with six ceramic sterasyl filter elements for installation in a Doulton RIO 2000 Big Blue filter housing. Six ceramic Doulton sterasyl filter elements for installation in a Doulton RIO 2000 Big Blue filter housing.